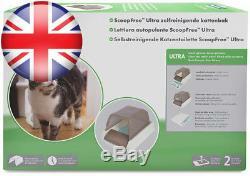 PetSafe ScoopFree Ultra Self-Cleaning Litter Box for Cats. Item Weight: 5.54 Kg. Product Dimensions: 69.5 x 48.2 x 17.9 cm. 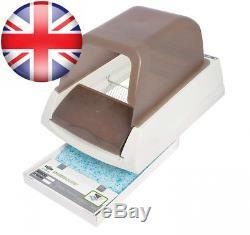 Special Features: Automatic^Hygienic^Easy to Use. EASY, PRACTICAL, HYGENIC - Rake automatically removes waste into a concealed area. 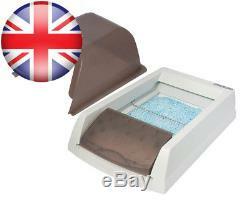 Disposable litter tray does not have to be handled and lasts for up to 30 days. 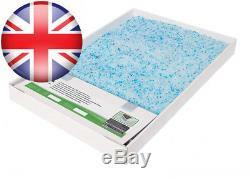 REDUCE ODOUR - The Tray's crystals absorb waste and all foul smells, meaning litter can be used for weeks. Up to 10 times less litter is used than traditional boxes. 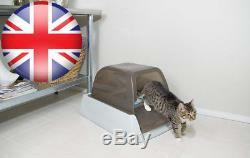 SUITABLE FOR ALL CATS - Large interior allows for use with all breeds of 6 months and over. The privacy hood reduces the tracking of litter and gives your cat extra discretion. HARMFREE - Cleaning starts once the cat has left the litter box. Safety sensors ensure that the cat is not harmed. Cycle can be customised to start at 5, 10, 20 minutes after the cat leaves. PetSafe automatic ScoopFree ultra self cleaning cat Litter box, odour free, hygienic easy clean, long-lasting kitten waste disposal The ScoopFree ultra automatic self cleaning litter box offers a practical and hygienic solution to your cats waste disposal. Once the cat has safely left the litter box the easy cleaning process begins. A feature of this ultra model is that the adjustable rake delay can be set to activate either 5, 10 or 20 minutes after use. The automated rake will quietly move the cat's waste into a hidden area. The tray's blue crystals absorb mess, dry solid waste and eliminate odour, allowing the tray to be reused for up to 30 days (based on one cat). The health counter tracks how many times the Litterbox has been used to help identify possible health problems with your cat. This hassle-free alternative uses up to 10 times less litter than traditional litter boxes and ideally reduces the time spent cleaning up after your feline. 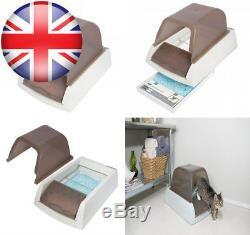 The ScoopFree also maintains discretion with the litter box privacy hood and silent motor. Product Dimensions Litter area - 35.5 x 35.5 cm Exterior dimensions (L x W x H) - 69.5 x 48.2 x 17.85 cm Height with hood attached - 43 cm Included in the box - Litter box - Adaptor with 1.8 m power cord - Litter tray filled with premium blue crystal litter - Privacy hood Important information This product is suitable for all cats over 6 months of age. The ScoopFree litter box must be used on a stable surface. PetSafe ScoopFree Ultra Self-Cleaning Litter Box. The item "PetSafe ScoopFree Ultra Self-Cleaning Litter Box for Cats" is in sale since Thursday, May 10, 2018. 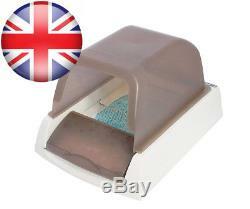 This item is in the category "Pet Supplies\Cat Supplies\Litter Trays". The seller is "clearance-itemsuk" and is located in GB. This item can be shipped to United Kingdom, Antigua and barbuda, Austria, Belgium, Bulgaria, Croatia, Cyprus, Czech republic, Denmark, Estonia, Finland, France, Germany, Greece, Hungary, Ireland, Italy, Latvia, Lithuania, Luxembourg, Malta, Netherlands, Poland, Portugal, Romania, Slovakia, Slovenia, Spain, Sweden, Australia, United States, Canada, Brazil, Japan, New Zealand, China, Israel, Hong Kong, Norway, Indonesia, Malaysia, Mexico, Singapore, South Korea, Switzerland, Taiwan, Thailand, Bangladesh, Belize, Bermuda, Bolivia, Barbados, Brunei darussalam, Cayman islands, Dominica, Ecuador, Egypt, Guernsey, Gibraltar, Guadeloupe, Grenada, French guiana, Iceland, Jersey, Jordan, Cambodia, Saint kitts and nevis, Saint lucia, Liechtenstein, Sri lanka, Macao, Monaco, Maldives, Montserrat, Martinique, Nicaragua, Oman, Pakistan, Peru, Paraguay, Reunion, Turks and caicos islands, Aruba, Saudi arabia, South africa, United arab emirates, Ukraine, Chile.